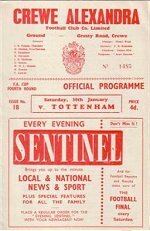 On January 30th 1960 Crewe recorded an excellent result, drawing 2-2 at home to First Division Tottenham Hotspur in the Fourth Round of the FA Cup. They must have wished they hadn't got that draw - in the replay on Wednesday February 3rd they were beaten 13-2! Click on Midland League 1959/60 for Peterborough's final non-league table.